Recently I mentioned this idea to help have a clutter free home to a couple of people and they had never heard of it. So I thought I’d share it here. I do a major house cleaning in the spring and fall. That’s when I put up my off season clothes and change my bedroom up for the next season. So I go through most of my drawers and closets during that time. But to keep up with the clutter in between those major cleaning times I do this little trick that I learned a few years ago. I think it was from Flylady. Some days it’s five big things like lamps, dishes, or furniture we don’t want anymore. Other days it’s small things like expired medications or last week’s newspaper. Throw away, give away, or sell. Anything as long as it gets out of my house! Some things I take to the flea market. But that has to mean that they can’t come back into the house if they don’t sell! Leave me a comment if you’ve tried this. 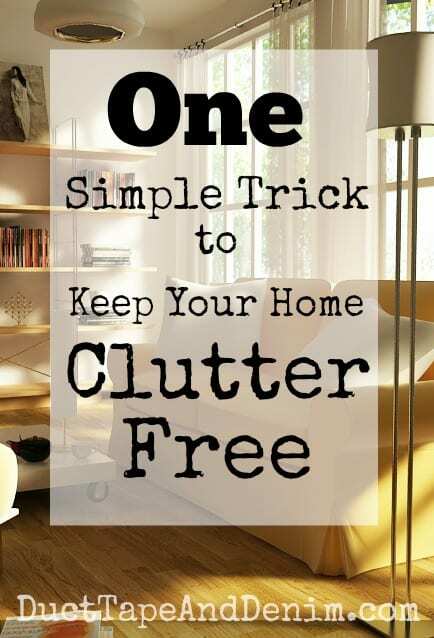 Or if you have any other tricks for a clutter free home! I’ll have to try this. We are in the early stages of planning a move to Texas. This will help get rid of a lot of “Junk” that I don’t want to pack and take with us. Thanks for sharing! Where are you moving? I’ll be in Texas in September! We’re doing that now and it’s working. Lots of trips to drop off goodies to the charity drives, etc. I don’t miss those items either. I also give pens, pencils, craft items etc to our neighborhood schools. Arletta,I live in Texas. San Antonio. Welcome. I have a basket in my mud room and when I am cleaning I gather things I want to purge I put in the basket and once a month I take it to our local good will. I usually have way more than the basket will hold. Where does it all come from? I feel the same way, Melody! Love this post! one of my goals for 2016 is to de-clutter my home…I’m a stuffer…If you came into my home you would be impressed with my homemaking skills until you opened a closet or desk drawer 🙁 but I’m working on it!!! I feel like that, too, Kellie! My house usually looks great… but don’t open that closet! I really like your idea. Living with 2 hoarders ( son and husband) makes clutter-fighting a constant battle anyway but as I get older I find a sentimental tendency creeping up on me for saving “momentos” from everything. So: 5 a day Throwaway starting now! Such great advice! I had forgotten about Flylady… Haven’t heard that name in years. Thanks.